The Game released his new single for his mixtape Purp & Patron and also off his new album R.E.D. Album called “I’m the King” and can be heard here. Panic! At The Disco have been recording their new record “Vices & Virtues” and what comes along with a new record is a tour. Panic! At The Disco will be performing on February 1st as their first 2011 show in New York City. The show will give you a chance to hear new stuff before the album comes out! To learn more, check after the jump! You can check out the music video for “Take A Photo” after the link. Architects have posted a new song entitled, “Delete, Rewind,” on their Facebook. Toss the guys a “like” and check it out, here! Once a hot place for budding new talent, Myspace is rumored to be cutting their staff in half this week. Our thoughts are with those soon to be joining most of UTG in the unemployment line. Wiz Khalifa and Mac Miller Spring tour? 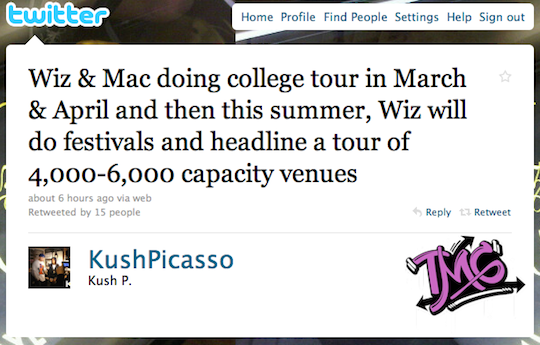 Check out this tweet from within Taylor Gang about a Wiz Khalifa and Mac Miller Spring college tour. More details will be released when they surface. Swag has landed in a heap of trouble for dealing and trafficking Oxycontin in Seattle. Check out more details after the link.